Walt Washington, county auditor, issued a statement saying ballots will begin arriving Oct. 19 and that this year’s ballot will require two first-class stamps should you choose to mail it back. Or you can weigh it to get the exact postage. The bottom line is one stamp won’t be enough. Washington also offers information about licensing, housing and shelter programs and financial reporting. Boy am I embarrassed. I’m wrong, and I picked the wrong day to come in late to the office. I’ve had one call and a couple of e-mails to remind me that I was off by a long shot in this post. In 1994 especially the state House did make a dramatic shift from Democrat to Republican control, similar to what happened in D.C. One caller assumed that I read state Legislature information incorrectly, reading 1994 instead of 1995, when the actual members of the Legislature would have changed. He’s probably right, but I compiled this information about a week ago, so I don’t remember for sure. I got it wrong. Below is a corrected version of what I wrote. That Republicans will pick up seats in Congress and that their counterparts in the state House will benefit has almost been discussed as a done deal. If you look at the last six times a president had his first mid-term election, though, you’ll see that the national trends don’t necessarily mean the makeup in Olympia changes at all. In fact, in the last three instances there was no change in the Washington House of Representatives. In the 1994 election the shift in state numbers was proportionately larger than what happened nationally. In 2002 and 1990, though, there was no link between what happened nationally and what took place here in state. If you look at each House individually, though, the data from the last six elections does suggest Democrats are likely to lose seats in each. In each case since 1970 there was one exception to that rule, but you know what they say about exceptions. With the other four legislators I spoke with we didn’t seem to get into that question as directly. Jerry Cornfield at the Herald in Everett wrote about Republican hopes that the GOP will have more power after the 2010 elections. In 2006 and 2008 a lot of people figured that Democrats did so well locally because Democrats did so well in the national races. But I checked the numbers from the last six times a president was in his first term and in only two four mid-term elections did the state House numbers go in the same direction the Congress’ numbers did. I didn’t include Senate numbers. Those might tell a different story. George W. Bush’s first mid-term was an exception. It was the only one of the last six in which the president actually picked up seats in the House. 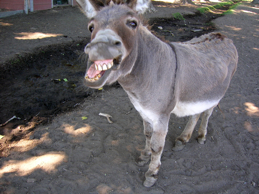 In Washington there was no change in the House in Olympia Democrats picked up two seats. In 1994 Bill Clinton saw 52 House seats lost, but in Olympia there was again no change and in Olympia 29 seats switch from Democrat to Republican. In 1990 George H.W. 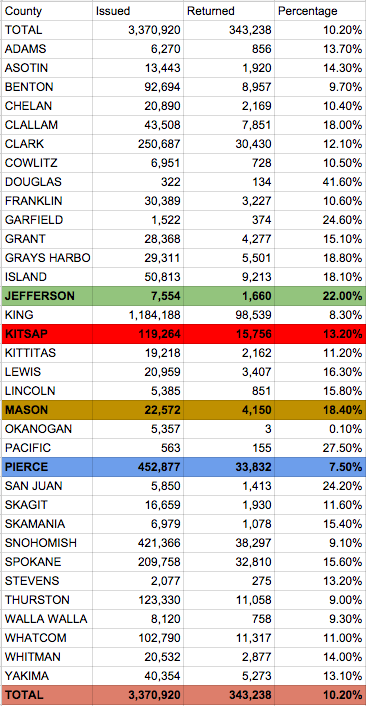 Bush lost eight seats, and there was no change in Olympia, but Republicans in this state gained five seats. In 1982 Ronald Reagan lost 26 seats in the House and the Republicans Democrats picked up seven nine seats in Olympia. In 1978 Jimmy Carter lost 15 seats and in Washington Democrats lost 13. In 1970 Richard Nixon lost 12 House positions and Washington Republicans lost nine. When I had the wrong information up I was quite surprised by it. I took it as logical that the national mood certainly influenced more Democrats to vote in 2006 and 2008 and more Republican leaners to leave their ballots unchecked. I wondered if the shift depended completely on Democrats. Growing up I was told that Republicans vote in more elections than Democrats. I don’t have the data to back that up, but it got me wondering if election results depend on how excited the Democrats are. The surprise I felt should have spurred me to take a second and third look at the numbers. Back in the day, as in a few months ago, there was a nice little give and take between Bremerton and Bainbridge Island on the Bremelog. For the record I suspect sock puppetry, really, and the moderator has now become a Bremerton slumlord and bolted from the finer side of the sound. There isn’t much going on over at the Bremelog anymore. Still, there are real differences between Bremerton and Bainbridge Island, namely the kinds of Toyotas we drive and the quality of our ferries. When I covered the island I always approached the supposed snootiness of islanders as overblown. But last Saturday my family and I went with family members who were visiting the area from Vancouver, B.C. to play in soccer matches on the island against island teams. Some guy wearing a BIFC scarf asked us if we were from Canada. My wife pointed to her sister and said she was, but that we were from Bremerton. Our islander acquaintance lost interest in us. It made me feel better about the fact that my nephews totally trounced the island kids. One of my nephews scored three goals, one with his right foot. Nonetheless, it appears there is something on which the elect on the island and the great unwashed in Bremerton can agree: marijuana laws. It’s “a little less predictable” to gather signatures with an all-volunteer staff, Dawdy said, but the group has had success across the state. He said one signature-gatherer working the Bainbridge Island ferry run collected 800 signatures in 21/2 weeks and that a Bremerton head shop collected 400 by putting a copy of the petition on the counter. I assume the head shop is Pied Piper’s, but there may be other shops I don’t know about. Since I don’t have much demand for their products, I’m not a customer. The one time I did go in was when the store had to move the first time, out of the space it once had where the Tim Ryan building is now. I naively asked if it was a place to buy things to help to smoke pot. I was informed it was a clothing store, a place where one could buy artistic pieces of glass. It was true. There was clothing and glasswork. The shirt was very comfortable on me when I later smoked from a glass pipe I bought there using pot I bought from my island source. I kid. The source was from Port Orchard. I kid again. Now it’s easy to assume that ferry commuters on Bainbridge are not from the same demographic as artistic glass aficionados in Bremerton. But my point to to that scarf-wearing dude at the soccer game is that we’re not so different. We can find common ground. I wonder if one of the 800 signatures on Bainbridge came from this guy. I can’t tell you how glad I am when something like this didn’t happen in Bremerton. We’ve been recording video of our editorial board discussions with primary candidates, but today we ran into some technical difficulties (seriously, we didn’t just forget to plug it in). So, this time in our editorial board’s interviews with Bainbridge Island North and Central ward candidates, we recorded the audio of the discussion for those of you interested in listening in. I’m sorry if you were really, really looking forward to the video. But now you can download it to your iPod. Since the discussions run about 50 minutes or more, the files are pretty large. Please be patient while the file loads into the player and feel free to let me know if you have any problems. Below is audio for Bainbridge Island Council Dist. 5 candidates Virginia Paul, Debbi Lester and Dee DuMont. Click play. Below is audio of the interview with Bainbridge Island Council Dist. 7 candidates Debbie Vancil (incumbent), Bob Scales and Melanie Keenan. On the Secretary of State’s election site, which includes an online version of the voter pamphlet leading up to the Aug. 19 Primary, is included a PDF file entitled, How is the United States President Elected? You grammar cops never mind for a moment that “is” should be capitalized. There are bigger violations here. Thanks to Jeff Duffy of Port Orchard, this egregious error has been called to my attention. The page is a nice handy explanation that, no, dummy, you already had a chance to vote for president and being the stinking, self-righteous, so-called journalist you gave up that right and sat it out. Well, that’s what it would say if it were directed at me, to which I would respond that I do not often stink. The bigger problem appears at the right. The eagle is lovely, but appears angry. And well he or she should be. 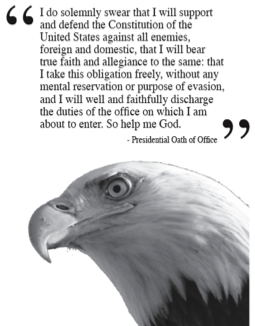 The oath above said eagle is indeed an oath, but it’s not presidential, else John McCain and Barack Obama might already be presidents. The oath shown is the one members of Congress take after picking out desks at Ikea, but before opening accounts at the Senate or House credit unions. I didn’t give Washington Secretary of State Sam Reed an opportunity to respond to the goof. Instead I’m going to engage in the activity enjoyed by so many anonymous story commenters — ignorant blame-throwing and random speculation. I say it’s the fault of the secretary’s newest hire, David Ammons. I have all kinds of respect for Ammons, who ruled the Capitol building as an Associated Press reporter starting sometime after the Gutenberg Bible but before Pong. He left this year to work for Reed, making Ammons the most likely suspect. Here’s where I pulled my conclusion.